Right now, more than 100,000 people are trying their best to control a single trainer over at 'Twitch Plays Pokemon.' They know that if they send in a command via the 'Twitch Plays Pokemon' chat, it'll make the character in the streamed version Pokemon Red do something. What many of them don't know is that, in doing so, they're also controlling a game of Tetris elsewhere. 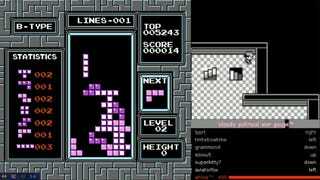 'Twitch Plays Tetris' is a streaming channel that, much like 'Twitch Plays Pokemon' is controlled via chat input (if a player says "down," for example, the piece moves down). The funny thing is, instead of taking the input from the chat on its own channel, 'Twitch Plays Tetris' takes all the chat commands from the 'Twitch Plays Pokemon' channel (which also means the game allows for Tetris pieces to move up on the screen, not just down—since 'up' is a command in 'Twitch Plays Pokemon'). It's an absurd creation, the likes of which you can only experience on the internet. Heck, you can see the progress on 'Twitch Plays Pokemon' here, too. You might also notice that it has its own version of the new 'democracy bar' introduced in 'Twitch Plays Pokemon'—only this one is called the 'whine bar' and it's kind of making fun of how much people complain about the democracy bar in 'Twitch Plays Pokemon'. And just like 'Twitch Plays Pokemon,' this game of Tetris is rather chaotic—this really isn't the most efficient way to play Tetris, but it sure is entertaining! 'Twitch Plays Tetris' is also not the only game of its type. Following the immense success of 'Twitch Plays Pokemon,' there have been a number of similar channels that use commands from Twitch chat. There's 'Twitch Plays QWOP,' which is probably the most obtuse way to try to play QWOP, and there's also 'Twitch Fights Itself,' which is a Twitch-chat-controlled game of Street Fighter II. Heck, there's even 'Twitch Plays Pokemon Blue' (the more popular stream, 'Twitch Plays Pokemon,' is streaming Pokemon Red). Now I can't help but wonder if there are people over in 'Twitch Plays Pokemon' who are trolling it by trying to play Tetris on the other stream. Heh.